VGH contributor and retro game aficionado Cesar Gutierrez finally got his hands on the latest of Hyperkin’s retro consoles. How does it compare with the real thing? Do you have retro video games you want to play, but no longer own the console to play them on? Even if you do own it, don’t you wish your games looked better on your high-definition television? Many of these televisions lack the composite inputs needed to use these older consoles, and the ones that do have them will often process those signals poorly, making your games look blurry, with muted colors that are generally not pleasant to look at. 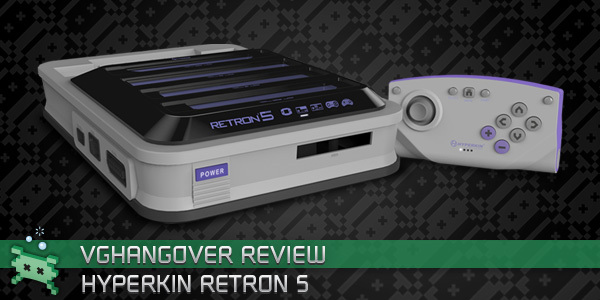 Hyperkin aims to address these problems with the latest iteration of their line of RetroN consoles, the RetroN 5. With HDMI output as the basis for conveniently connecting ten different consoles to an HDTV, is the RetroN 5 worth buying? First off, it supports the NES, Super NES, Genesis, Game Boy, Game Boy Color, Game Boy Advance, Famicom, Super Famicom, Mega Drive, and with a power base converter attached to the Genesis slot, it can also play Sega Master System cartridges. Count ‘em, that’s ten different consoles! On paper, it’s extremely convenient for those who have multiple consoles daisy-chained onto their current setup, which in turn would free up a lot of the clutter behind your entertainment center, as well as freeing up a few power outlets in your surge protectors. On the flipside, those who were never into retro gaming, or no longer own a number of the aforementioned consoles would find an easy entry to a couple of exciting eras of gaming history. I say “on paper,” because the RetroN 5 I bought only managed to last the better part of a night before the console starting showing some serious issues reading cartridges that it had no problem reading just hours before. I could have just bought a defective console, though several posts on Hyperkin’s Facebook page lead me to believe that the various pin connectors inside the system were poorly made. In my case, it had several connectors that had a vice-like grip onto the NES and SNES games I inserted, and it initially felt as if I was going to rip the connectors out of I had pulled my carts straight up out of the console. The grip did loosen up somewhat after putting in a few carts. I read that this is par for the various clone consoles that are on the market, but since I never played with any of those clone consoles prior, I was taken aback with how tight a grip it had on my games. Because my console died prematurely, I didn’t get to extensively test the various games in my collection. Additionally, Hyperkin released a firmware update that can easily be found on their Facebook page that promises to fix several compatibility issues I had when I first played with the console. Therefore, if you plan on owning a RetroN 5 in the near future, the experiences I had (in terms of compatibility of games) will probably mirror yours unless you find an SD card and install the latest firmware update. My experience with the console was a mixed bag. Games that are notorious for not running correctly on other clone consoles, such as Super Mario RPG, Star Fox and Yoshi’s Island worked on the RetroN 5, though Yoshi’s Island at the time was recognized as an “unknown cartridge”; you would still be able to run the game in this instance, but saving to and from the actual cart would be disabled. You could, however, utilize “save states” in any instance, in which the system would take a “snapshot” of your current place in the game, and you would have the ability to load these states at will by either going through the system’s menu options, or through mapping a custom hotkey combination of buttons to save or load such states. You can map these combinations using any of the original console controllers. I used these save states to go through Space Megaforce–a game I was never able to beat–in about an hour, which is amazing. Button mapping is remarkable in that not only could you map a combination for saving and loading your place in any game, but you can also map combinations for taking screenshots, fast forwarding games at about three times the normal speed, and accessing the system menu. You can also play games that support more than two players, such as Secret of Mana and Super Bomberman, by manually selecting within the RetroN 5’s menu system which controllers are assigned to each player to create a “virtual multi-tap” of sorts. For instance, if you wanted to play a four-player Super Bomberman game on SNES, you can assign the SNES ports for players one and two, and players three and four can use the Genesis controller ports. The RetroN 5 is able to play the aforementioned systems from any region. 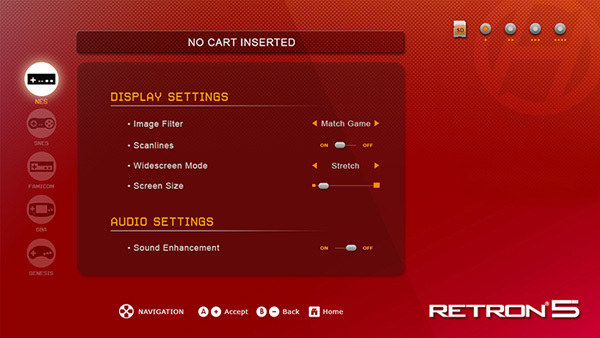 It has the option to automatically select the correct region depending on the game you put into the system. For instance, if you wanted to play a PAL version of Terranigma, the system would automatically reproduce a frequency of 50Hz so that it could run the game at the correct speed. In layman’s terms, you can basically import games from any of the supported systems from anywhere in the world, and the RetroN 5 could theoretically run any of those games! One of Hyperkin’s goals with the RetroN 5 is to achieve 100% compatibility of all officially released games across all supported systems. Unfortunately, there are factors that would make it impossible to achieve that goal. For one, games such as Duck Hunt or Super Scope 6 will run, but will not work with light guns because of the differences in refresh rates between traditional CRTs and modern HDTVs. Second, in order for the RetroN 5 to properly read cartridges, the pins would have to be extremely clean. This is easier said than done, because I often found myself having to open the carts and clean the contacts extensively. Doing so will not only ensure that the RetroN 5 will properly recognize the cartridges, but it would make it easier to remove the cartridges from the system. Lastly, multi-cart attachments such as Game Genie and Super Game Boy will not work as intended, since the system essentially emulates a ROM dump of these attachments, but never with whatever game they are attached to. For instance, if you put in a Super Game Boy with Link’s Awakening inserted into the cart, it will only show you the Super Game Boy border, and a black screen. Speaking of Game Genie, Hyperkin promised support for built-in cheat codes via database files that can be copied to an SD card in lieu of entering a string of codes as was traditionally done with an actual Game Genie attachment. As of this writing, Hyperkin has released their cheat database that has since been updated several times in the form of XML files that are about 5-6 MB and you can find a link to this and firmware update instructions on Hyperkin’s Facebook page. I’ve been reading from other RetroN 5 owners on posts in that very page that these cheats are far from working perfectly. There are reports from some cheats working on some games to none working on other games, and I’m also reading that none of the cheats are working for any Game Boy games at this time. Games that do run looked absolutely amazing on my glossy Vizio set. The colors were no longer muted, everything from NES to SNES and Game Boy games looked sharp and crisp, everything seemed to be running at the correct speed, without discernible lag (provided that your HDTV has “game mode” turned on) and the games sound just as good as if they were running on the actual hardware. For every game that can run on the system, you can turn on scanlines to emulate how games looked on a CRT screen, which looks pretty good without filters, in which you can see all the jaggies throughout the screen. If you’re not a fan of jaggies, there are filters which soften how crisp or sharp the picture looks to various degrees, with specific filters working better on some games than others. One game that really benefits from filters is Yoshi’s Island, with its art style simulating the look of watercolor paintings. The “hq2x” filter smoothed out every pixel in the game, which accentuated the game’s watercolor aesthetic and made it look much better. There are also options to enhance the audio by turning on bass and treble boosts, which increase the audio tones of low and high frequencies, respectively. Honestly, I would not mess with these options, because I find that they distort the audio, and I didn’t really notice any discernible improvements by having them on. With that said, I didn’t notice the audio sounding off in any particular way. Again, it sounded just as good as the actual hardware. And like real hardware, games notorious for slowdown played exactly the same way on the RetroN 5. Gradius III still chugged as I was shooting giant green and blue bubbles near the beginning of the game. This is worth noting, as the system’s processing made no attempt to correct the speed of the game. Some (such as myself) like playing Gradius III with the slowdown, as it give those players a better chance of completing the game, and some hate the slowdown for it highlights the technical limitations of the SNES at the time. So is the RetroN 5 worth your time and money? Well, that depends on what you want from the system. Cheat codes are still not live, and the durability of the system is somewhat questionable, especially with regards to its pin connectors. Its vice-like grip had me worried that pulling games out would damage either the games themselves of the connectors. The included Bluetooth controller is also nothing special. 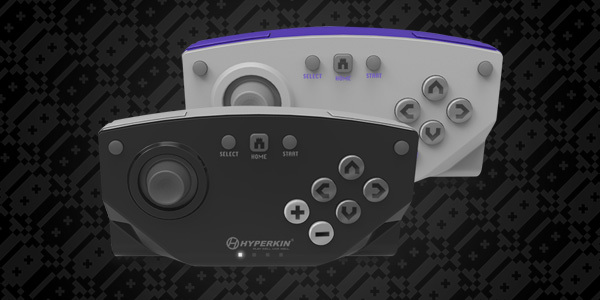 In fact, I would have preferred that Hyperkin not include the controller. It felt cheap and fragile, ergonomically blocky, and the micro-switch directional pad wasn’t as responsive as I would like it to be, especially with games that involve precision and accuracy, such as Street Fighter II Turbo or F-Zero GP Legend. It’s just not a controller I would regularly use. However, games look really good and the emulation is as accurate as any game I’ve played on actual consoles. If you really need to buy one, make sure you keep your receipt in case any problems arise. The RetroN 5 is a very good system, when it works, but I would wait for a hardware revision to fix those tight pin connectors. * Save-states! You can finally beat those games you could never finish due to difficulty. This review is based on the commercial release of the Retron 5, purchased by the reviewer. If you end up owning a RetroN 5 in the future, alternate pulling up on the cart left and right until your games come out, and never straight up. Doing so might damage your games, or the console itself. Cleaning the pins prior to inserting games into the console also helped in it not griping so tightly. Speaking of Terranigma, I had someone make a reproduction cart of that game to play on my American SNES, since that game was never released stateside. This repro cart did work on the RetroN 5, albeit as an “unknown cartridge”. The RetroN 5 also failed to recognize the save files I had on the cartridge, even though they reappeared when I put Terranigma on an actual SNES console. The same is true for other unknown cartridges, reproduction or not. Hyperkin never explicitly mentioned that their RetroN 5 would support reproduction carts, since there is no standard as to how those carts are made, and for the system to recognize every repro cart out there would be a pipe dream, since not every repro is made with the same workmanship as my Terranigma cart.